» Is Chime Still worth Signing up for or Keeping Open? 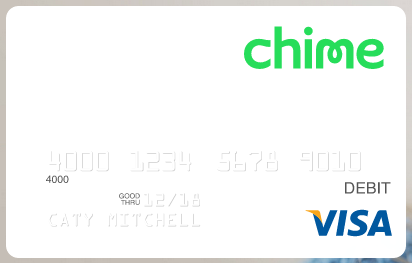 Chime has been a great card for a little extra manufactured spending every month. Was it better than Visa Buxx, Serve, or Bluebird? No, but it was an easy way to earn $30+ monthly, with very minimal effort. Sadly, though, that day has come to an end. 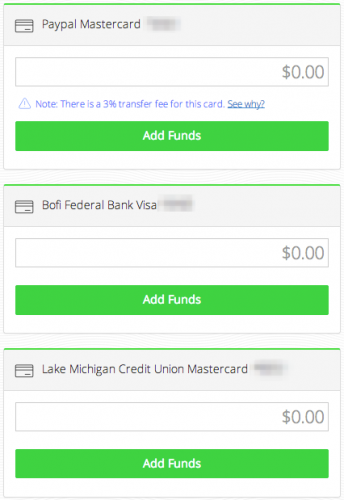 As of October 8, Chime has been charging a 3% fee for “smaller bank” debit cards. In other words, they mean debit cards that earn you rewards. So, the 1% cash back earned with a Paypal Debit by loading Chime, now costs you 2% and earns you nothing. Does that mean Chime is completely useless? I don’t think so. Next, I tried my JH Preferred card that has been shelved since the death of our dear Vanillas. That didn’t work either. The error code that popped up for that card was, “The address attached to your debit card needs to match the address on your Chime account.” Of course, I checked it to verify that they were exactly the same and they were, so that card wasn’t going to work. Finally, I tried my actually debit card to verify that my account could accept new cards and that worked fine. Is there any debit card that will earn points, miles, or cash back when loading Chime? Yes… hopefully. Chime’s redeeming grace is UFBDirect’s Airline Rewards Checking account. The UFBDirect card earns 0.5 AAdvantage miles per $1 spent, which is not great compared to a credit card, but for a debit card it’s one of the few options left. Here’s how it shows up in Chime (it’s the second card). As you can see above, there is no 3% fee added to UFBDirect loads, but does it still earn miles? It used to and I think it still does, but I can not test it yet. I added my UFBDirect card to my account when I first opened Chime, however, I only loaded it once to test the waters. Guess what, the miles posted. That doesn’t mean I used that card often, though. I preferred to use my Paypal Debit for Chime loads, so I shelved my UFBDirect card since then. Three months later (October 8th), I logged into my UFB account to add money to my account, so I could test load Chime, and I saw the following screen. It looks like my account was closed, but my login information still worked. I then contacted UFB and asked them what happened. Apparently, there an inactivity clause that caused my account to be closed. Now, I have to wait for my new card to arrive before I can test load Chime. So, if anyone has loaded Chime with UFB after the 3% fee started applying, please let us know in the comments. There’s one main reason I still like the idea of loading Chime; I love the underwear factor. I can load my Chime account daily, from anywhere, while wearing anything. I don’t have to go to the store to buy a gift card. I don’t have to buy a money order. I can simply log into my account and load it. It’s true, I need to buy an MO to cash out my Chime card, but I don’t have to go there every day. I can go there when I have $500+ or whenever it’s convenient for me. I like the flexibility. Chime offers are supposed to be the main perk for normal customers. They can give you store credit, usually around $2-$5, or they can give you cash off a purchase. Both of those perks are great, when you are already out shopping, but they really shine when they get you free stuff. For example, when Chime first opened it’s doors they offered $5 store credit to multiple stores, so my wife and I took full advantage of that and bought a lot of $5-$10 gift cards. It was a sweet deal. Lately, there haven’t been very many offers worth using, but that could change at any time. I think it would be worth keeping Chime open for the offers alone. Speaking of offers, there is a sign-up offer for Chime right now. You can find more details about it here. If you have a Chime account and would like to leave your referral link in the comments, feel free. There have been many reports on Flyertalk that MO purchases at Walmart with Chime have been denied just like OVs. I haven’t tested this, because I quit Walmart some time ago, but there are many other options for MOs. Chime has a monthly account maintenance fee of $5 after 180 days of inactivity. Be aware of this if you have an account and plan to keep it open. The best way to avoid this fee would be to add at least $25 (the minimum amount allowed), or make a small purchase like a $0.50 Amazon gift card, every 180 days. You could also close your account before the 180 days mark hits and reopen it. So, what do you think? Do you plan on keeping your Chime account open? Do you have a better way to use Chime than I mentioned above? Do you have experience with UFBDirect loads? If so, I would love to hear your input in the comments.